This is the second last kitchen sink post, so get ready for a new series. I want you to send TWO only photos showing your work space - that could be in your home, where you work outside the home, in the garden, on your farm, at school, or, for all those lurking blokes out there, your shed, garden or garage or where you go out to work - it could be the cabin of a big rig or your office desk. Please write two paragraphs describing your work space and something about yourself. I imagine we will get photos of sewing machines, knitting projects in comfy chairs, sheds, cooking, cars, horses, gardens and all sorts of wonderful places from all over the world. Please tell me where you are from and include a link to your blog if you have one. Send your photos to rhondahetzel@gmail.com ADDITION: Please make sure your photos are around 100k, no bigger, and no videos please. Thanks everyone. This is going to be a great series. Today's photo is from a town very close to where I live. In fact, the kitchen setup is very much like mine, including the placement of the fruit bowl. 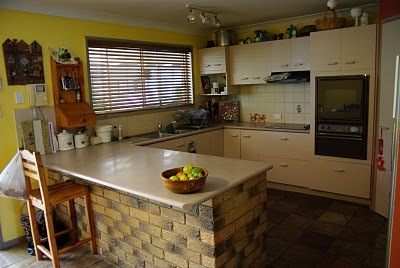 This is Debra's kitchen and she lives in Queensland, Australia. "This is my kitchen. It is just on 18 years old, we have been in this house since we owner built it back in 92, and I still love my kitchen. It is the hub of the house, as is most peoples. The only thing we have changed is we have put in a dishwasher, we removed 2 cupboards to do this, which left us with a little nook between the dishwasher and the next cupboard, which is a perfect spot for jars etc., and we have put in a new ceramic cooktop. The oven is still the same, we replaced the fan in that about 18 months ago, and the rangehood is still the original. The wide benchtop is brilliant. 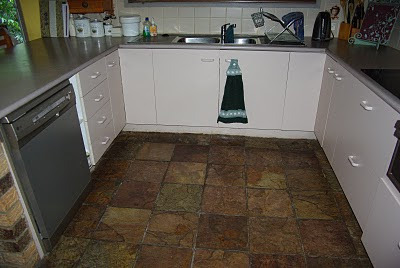 I did the tiling myself, and we also laid the slate floor ourselves. The kitchen window looks out over our entertainment area and greenhouse, and the dining area next to it looks out over the pool and garden area. I have a nice big walk in corner pantry, which, when tidy, has heaps of room for everything we could ever need. My knitted dishcloth is hanging over my tap :) I have to knit some more. I picked up some lovely cotton from an opshop I think they were something like 50c a ball, and I get 2 or so per ball of wool. I like this waffle weave pattern the best. You can visit Debra's blog by clicking here. Hi Rhonda,what a nice kitchen this is and looks like it has so much light.I have really enjoyed this series and look forward to the next one ,what a range that will bring!I am about to do my first dishcloths and make my first soap at 61 never too late I figure lol,I have been asking my little 33 year old friend for tips!!! I LOVE the brick and stone looking floor. It's a beautiful kitchen for sure! And so spacious! Your kitchen is so big! I love the tiling and I'm jealous of your vast countertop space. Really lovely overall. Lovely and roomy.I like the bright sunshine colour, makes you want to hang around there!Lots of good cupboard space too. Rhonda the new seriers sound like fun I hope to be in it too .Great choice. What a friendly looking kitchen. Love the big window! I love the kitchen set up! I have a home journal also, but I call it a "control journal"... a flylady.net thing. Still looking for a place to put it that I can use it easily. Debra your kitchen is lovely, so much space and very pretty to look at. Lovely roomy kitchen you have Debra, and thanks for introducing me to a "neighbour" Rhonda! Shalom Debra, What a great set up, a quick turn to the left or a quick turn to the right, you have a lot of counter space. We are two peas in a pod, I don't like clutter either. Thanks so much for the dish cloth pattern. I was just telling my daughter we need new dishclothes as the one I knitted not too long ago, didn't stand the test of time. Lovely kitchen, Debra. It is very reminiscent of Rhonda Jean's. I had a look at your Blog, and noticed that you'd been to scrapbooking (I too scrap) at Brookfield. Is that Brookfield, as in near Pullenvale? This is my neck of the woods, if so. Did not know there was a scrapbooking event nearby.....Lucky you! Thanks for sharing your light filled, inviting kitchen with us. Very inviting! I love kitchens that are clean, organized, but look lived in and workable. I love the bright color of the walls and the crisp white of the cupboards. Can't wait to see what the next series brings. This time I might send something (Canada needs to be present). Love the floor!!! Gorgeous!! You have a lovely,bright,cherful,cozy kitchen!! Your kitchen has given me an idea for ours. I have always wanted to do something with the area around the back of my counter island area. The brick around yours has my creative side brewing for mine now. What a beautiful kitchen. It is my favorite color, the window is nice and big, and it is very tidy. I could really love working in your kitchen. Thank you for sharing the pictures. Love the big counter top. The colors in your kitchen are very calming. Thanks for sharing! Debra, I admire your and your husband's craftmanship. It's impressive that you have done so much yourself. What a sense of pride you must have whenever you are working in your kitchen, enjoying the results of your own labor. I haven't tackled any projects quite so large, but I do enjoying knitting my own dishcloths. Thanks for including the waffle weave pattern!